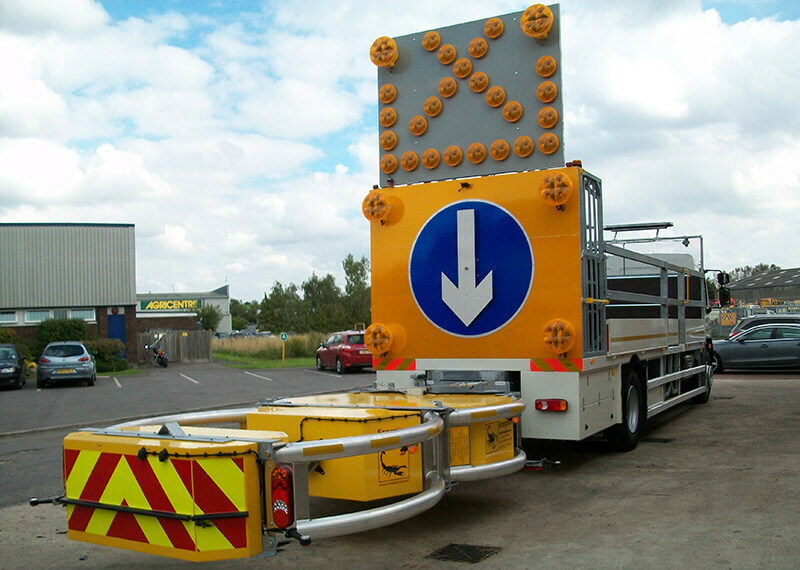 The Scorpion crash cushion is revolutionary in the UK traffic management industry. The Scorpion’s modular design creates an unbeatable standard of performance. Rigorously tested both in the USA and UK, this unique cushion brings many benefits to the user. • The lightweight, aluminum construction of the tubes is corrosion resistant and weighs just over 900kg. • With its modular design, the Scorpion crushes in progressive stages upon impact thus reducing repair costs as only the sections of the cushion that are actually damaged need to be replaced. The aluminium boxes are filled with moisture-proof, aluminium material which absorbs the energy from an impacting vehicle. The unique curved design redirects side angle impacts away from the exposed corner of the truck, offering full width impact protection along the entire length of the cushion. Other manufacturer’s models have little or no side-angle impact protection. Scorpion can be easily and quickly mounted to, or removed from, the truck. The cushion will fold at 90° to the truck bed during transport and storage. It’s compact design when folded creates very little overhang beyond the rear of the truck (approx. 1m). The Scorpion crash cushion can be easily mounted directly to the frame of most trucks, in order to accommodate a variety of truck models. Acklea can supply various brackets and extension frames to increase the Scorpion’s versatility. The hydraulic system allows the cartridge to be partially raised for maximum road clearance and manoeuvrability. The Scorpion crash cushion has been designed and built to last. Extensive testing, simulating thousands of miles, driving over 600+ curbs, risers and drop-offs, ensures the Scorpion’s durability and performance is assured. 3-53, and the UK test TD49/07 at 110km/h or 70mph. It is also the only cushion to have taken and passed the side impact re-directional test which is an optional test at this level. The Scorpion is the only cushion to have actually taken and passed in the UK the TD49/07 test at 110km/h or 70mph. 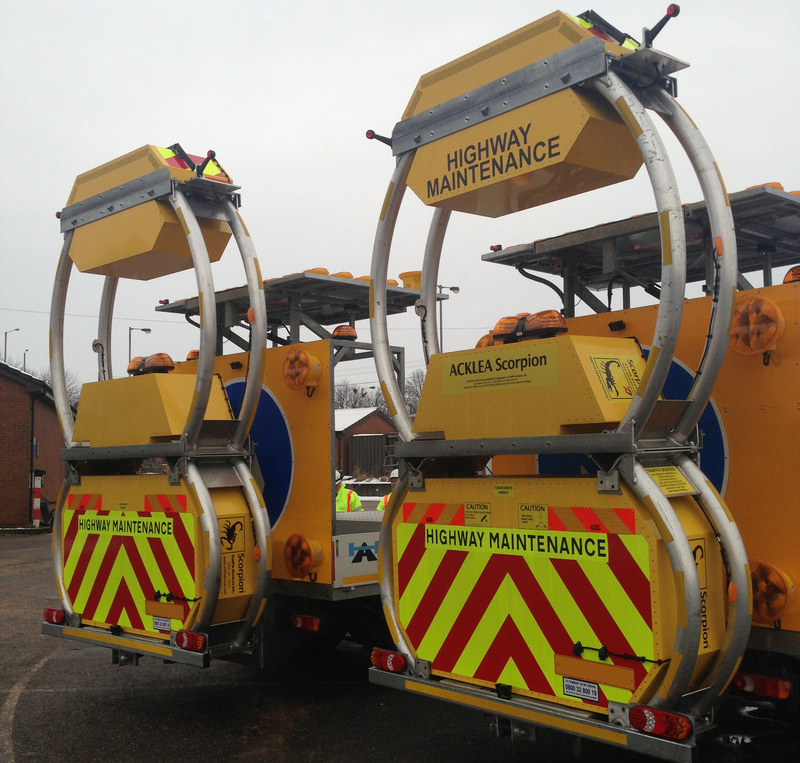 Acklea manufacture bespoke trafﬁc management vehicles to a customer’s speciﬁc requirement. Cameras, a colour monitor, microphones and infra-red for all round vision and control can be included on the support vehicle, as can boxes for sand bags, lights and spider legs as well as storage for cones on the bed of the lorry. Signs can be stored in Acklea’s unique racking system. Customer’s also have the option of a VSA board and standard four-way, lighting systems for total versatility. Acklea’s knowledgeable sales and engineering teams can assist you with any installation or technical questions you may have. Our engineers are available to respond to any calls. Acklea aim to provide the highest quality equipment backed up by a ﬁrst class support service – it’s a service you can rely on.